This article provides a comprehensive guide to the tools needed in the study of epithelial to mesenchymal transition (EMT) in both neuroscience and cancer. 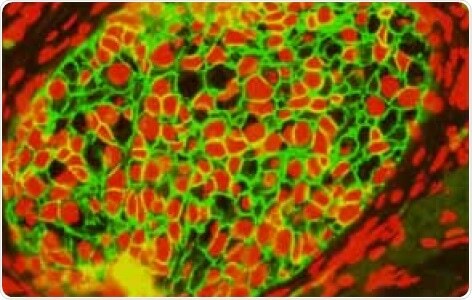 During EMT, epithelial cells become motile after undergoing defined molecular changes. This process is reversible. Tight junctions, adherens junctions and desmosomes are disassembled during the process of EMT. This results in the loss of such epithelial markers as E-cadherin, claudin and occludin. A loss of apical-based polarity is caused by this decline of specialized cell-cell contacts. Immunohistochemistry (formalin/PFA-fixed paraffin-embedded sections) of human breast carcinoma tissue stained using anti-E cadherin recombinant rabbit monoclonal antibody (ab40772) (green). Cytoskeletal changes occur during the process of epithelial cells becoming mesenchymal cells. These changes promote cell motility as actin stress fibers are formed. With this, the intermediate filament composition shifts through the repression of cytokeratin and the upregulation of vimentin expression. 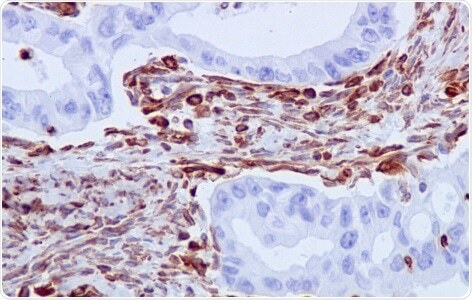 Immunohistochemistry (formalin/PFA-fixed paraffin-embedded sections) of human breast adenocarcinoma tissue stained using anti-vimentinrecombinant rabbit monoclonal antibody (ab92547). The activation of Snail, ZEB and bHLH family transcription factors mediates the transition from epithelial to mesenchymal gene expression. 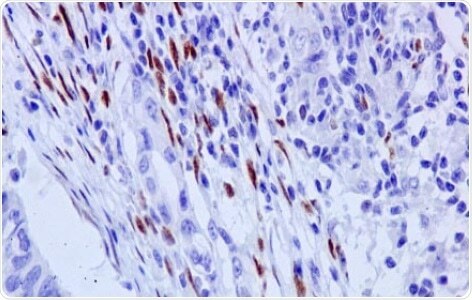 Immunohistochemistry (formalin/PFA-fixed paraffin-embedded sections) of human cervical carcinoma tissue stained with anti-AREB6 (ZEB1) recombinant rabbit monoclonal antibody (ab203829). Cell motility is facilitated in mesenchymal cells by the matrix metalloprotease expression, cytoskeletal rearrangements and the switch from E-cadherin to N-cadherin. 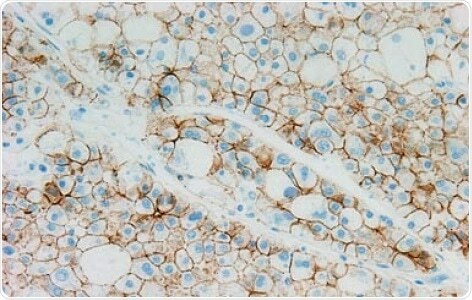 Immunohistochemistry (formalin/PFA-fixed paraffin-embedded sections) of human liver cancer tissue stained with anti-N Cadherin rabbit polyclonalantibody (ab18203).